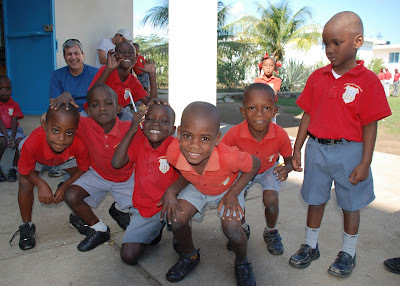 I spent last week in Haiti as the guest of Pere Jean M. Bruno and the Ecole St. Barthélémy school in Terrier Rouge. 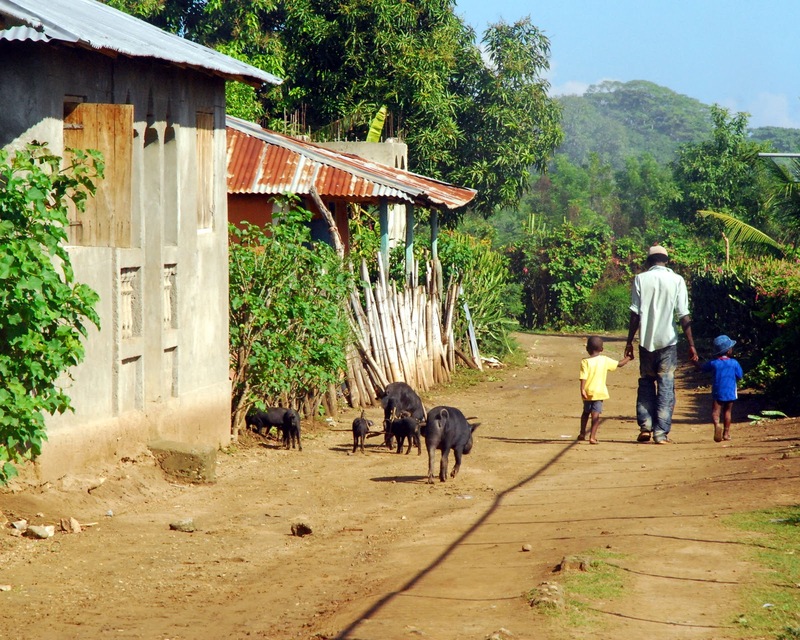 This village in northeast Haiti is 70 air miles from Port-au-Prince but it takes 8 hours to get their by car. One of the first things I learned about Haiti is that there are large mountains in the interior of the island– up to 8,500 feet tall. By way of reference, ski town Park City, Utah is at 7,500 feet. So, you've heard the saying "you can't get there from here"? Well, you can't. 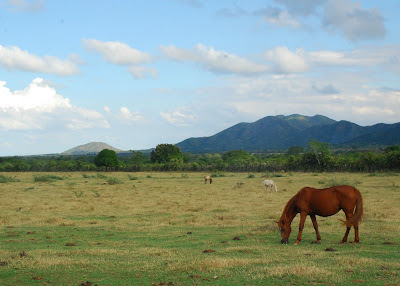 So we flew into Santiago, Dominican Republic which looked like a wild west town when we arrived and like the U.S. with armed guards when we returned. That is how much one's perspective changes after a week in Haiti. Santiago seemed dirty, primitive and dangerous on arrival and well-organized, clean and down right orderly when we returned. I even got used to the guys with the big guns guarding the hotel, the neighborhood restaurants, and my favorite, the valet parking. 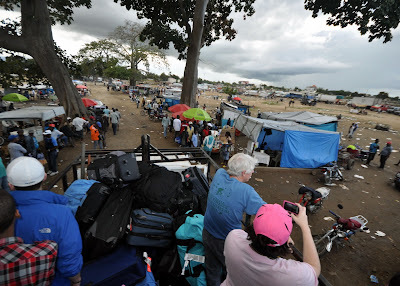 We traveled by bus to Haiti where the crossing over the border is best described as a "scene out of Dante's Inferno." I lack the vocabulary to accurately describe the chaos, the crowds, the trash and the craziness. It was very dramatic...for lack of a better word. We headed off to Terrier Rouge in the back of a flat bed truck which afforded us a safe haven and a great view. Until it rained. Oh well, at least it was warm. Terrier Rouge is about an hour away. It is a fairly large town (20,000 in the region) which lacks both running water and electricity. 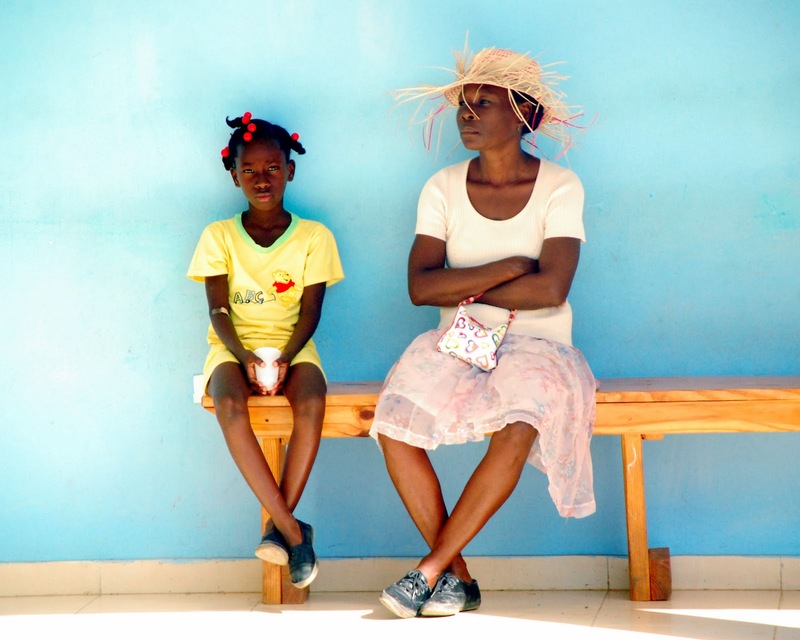 It is located about 30 miles from Haiti’s second largest city Cap Haitien. "Cap" is located on the water pressed up against the mountains. It was not impacted by the 2010 earthquake, but it is quite similar to Port-au-Prince in its sprawl and poverty. Over 200,000 people and not a stop sign or traffic light to be seen which makes it the most chaotic place I’ve ever been. Not to mention dangerous. An earthquake of any scope would devastate the place. Especially the houses hanging precariously from the hills above the city…They would simply roll down the mountain into the sea port. Pere Bruno is one of those amazing people who quietly changes the world. 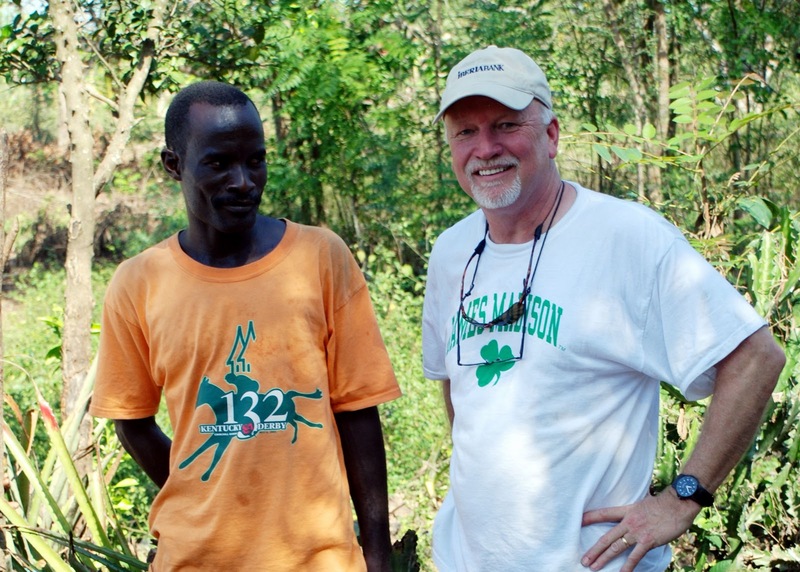 His school is a project done in partnership with Bethlehem Ministry, Inc., a non-profit organization out of Atlanta, created for the sole purpose of aiding Haiti's poor. He was recently quoted saying, “if you have faith, and do not doubt, you can say to this mountain jump into the sea. And it will." After spending a week with this man and seeing all he has accomplished and all he aspires to accomplish in the future, I believe him. If Pere Bruno decides the mountain is moving, it’s going to get wet. And, in typical Pere Bruno fashion it will happen calmly and deliberately with minimal fanfare. Bethlehem's Haitian efforts started some 25 years ago when they partnered with Bruno to establish a series of elementary schools in some of the Haiti's less recognized and lesser served regions. Over time they have established a Montessori based pre-K through 8th grade school (Ecole St. Barthélémy); an income generating, sustainable agricultural project (Jatrofa Pepinyè); and a medical clinic (Clinique Espérance et Vie), which seems to be making great strides at meeting the health and wellness needs of the local population. Construction has begun on a high school adjacent to the Ecole St. Barthélémy and the first $70,000 of the $200,000 needed to complete the project has been raised. Currently, Ecole St. Barthélémy is educating and, more importantly, feeding 700 students per day. To attend, students need $250 in tuition and a uniform. Uniforms and backpacks have been donated by various entities and some students are sponsored. The project’s intent is fairly straight-forward. 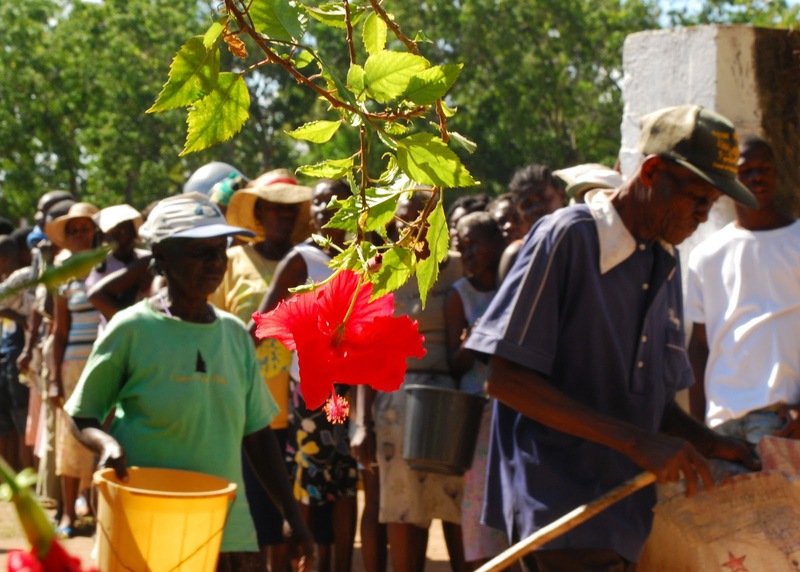 Both Bethlehem and Pere Bruno recognized years ago that education is the only way to break the cycle of poverty in Haiti – a country devastated by a harsh environment, a long-series of corrupt governments with little interest in helping its people, limited public utilities and transportation, no widespread individual agricultural efforts that can be utilized to feed it’s masses, a unique language that isolates them and a host of odd traditions and superstitions fueled by voodoo among other things. Suffice to say, it’s a complicated place with complicated problems. On the second anniversary of the 2010 earthquake we attended a moving service at the school before heading off to do a food drop at two isolated villages. The night before we had repackaged over a ton of food in to individual bags for distribution to those in need - rice, beans, oil, pasta and salt herring. A community leader distributed chits to various needy folks and they were lined up waiting for us when we arrived. We also built a garden for the clinic specifically for fruit trees and medicinal herbs. I can’t say I was particularly pleased with my design (done over a bowl of delicious pumpkin soup at lunch), but I’ll be delighted if it’s there and functioning as intended next month, next year and ten years from now…The Warrenton Presbyterians coming in behind us will plant it and hopefully a few of our new Haitian friends will tend it from there. Richard, who manages the clinic, did get some barbed-wire so he could keep the goats and pigs out…hopefully. 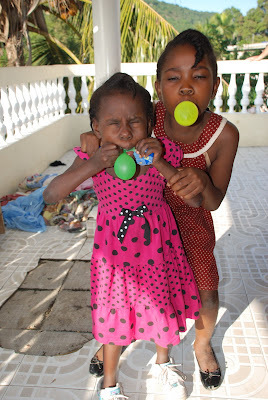 While in Cap Haitien we visited the Kay Anj (Angel House) Orphanage established by four folks from Haymarket, VA. It was, as all visits to orphanages are, both inspiring and distressing at the same time. This particular place is a wonderful oasis in the middle of a hillside slum. I feel badly about calling the area a "slum" since everyone seems to be doing the very best they can, but I don't know a better word to describe it. The children were sweet and loving and leaving them was difficult. To read more about this amazing project, click here. As guest of the school, we had deluxe accommodations – electricity (solar and generator), running water (no hot water), three square meals a day, briefly sort of cold beer each evening, an all important ceiling fan…and, yes, believe it or not, WiFi! So we were hardly roughing it. Cell phones worked perfectly in not inexpensively. That said, one of the great things about the projects tackled by Pere Bruno is he knows his limitations. He thinks globally and acts locally and he only tackles the mountains he knows he can move so efforts in Terrier Rouge, at the school and farm and the clinic all produce achievable goals and eventual results. My first goal is to raise enough money to provide several remote villages with clean water under Pere Bruno's direction. We had tried to visit such a village last week, but it had rained there and the road (as it is) was a giant bog and impassable. 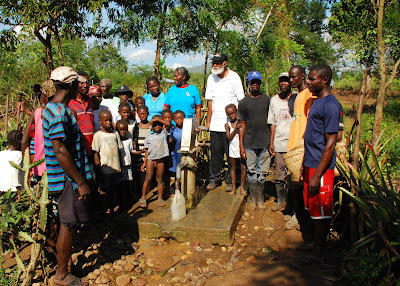 Each well costs about $2,000 to $5,000. Construction is expensive in Haiti - for example, gasoline is over $6 a gallon. If you would like to help, feel free to send a contribution to T.A.H. 's “Wells of Health and Hope,” c/o GPetty-VTA, 38 Garrett Street, Warrenton, VA 20186. To read more about Terrier Rouge, click here and here. For more info about the school, farm and clinic, click here and scroll down a little or here.